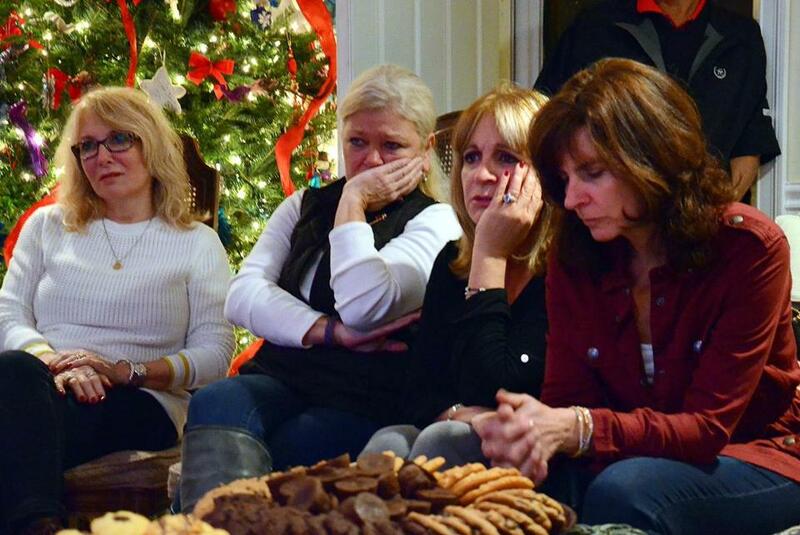 Kathleen Greiner from Marstons Mills cried as she watched the HBO documentary film “Heroin: Cape Cod, USA” at support group. She was joined by Carla Ferraguto from Onset (left) and Maggy Purdy (center) of Sandwich. BOURNE — Every time a needle pierced skin, the mothers winced. 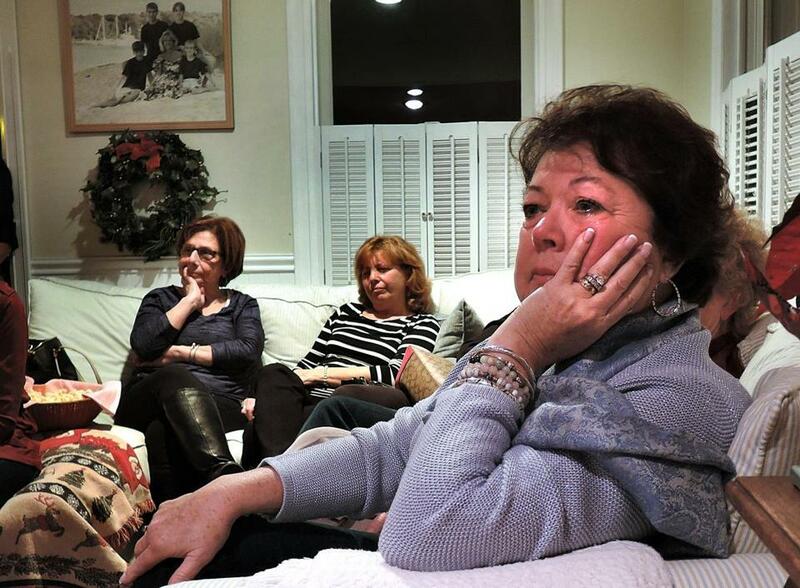 At a bed and breakfast inn earlier this month, a lively audience of middle-aged women watched some of the most painful aspects of their lives play out on film. They were being given a first look — before legislators, before the rest of the public — at “Heroin: Cape Cod, USA.” The documentary, which debuts Monday on HBO, focuses on the lives of eight heroin addicts raised on the Cape. The film, shot amid the Cape’s scenic beaches and main roads, shows in excruciating detail the grinding lives of addicts and the cycle of disease they endure — scoring, using, trying to get clean, and all too often relapsing. Directed by Oscar winner Steven Okazaki, “Heroin: Cape Cod, USA” paints such a devastating portrait of opioid addiction in Massachusetts that Governor Charlie Baker gathered legislators for a screening and discussion of the documentary on Dec. 15. Two of the women’s sons are featured in the film, along with scenes of the mothers during weekly meetings at their support group, Parents Supporting Parents. A year and a half ago, Okazaki expected to find three or four subjects for his film. Instead, there were more than 20 families waiting to meet him. This willingness to share their stories was the reason he chose to highlight Cape Cod. Raquel has tried to quit heroin many times in her 48 years, mostly to please probation officers. This time, though, she wants to quit for good. These are mothers who’ve struggled at the most basic day-to-day level to help their children — from buying them clothes that hide track marks, to sending them to recovery programs in Florida or California because being home is a trigger for using. Some of their kids are in rehab, others in jail. As the screening began, hands covered eyes. Bodies recoiled. Strained voices yelled at the screen at the scenes of self-destruction. “There’s our spoon,” one mother said, recognizing a household utensil. Brownish powder dissolved into yellowish liquid. Another mother stared. She’d never seen her son shoot up. He tied a tourniquet, gripped the syringe in his teeth, and filled it slowly. The other mothers sighed. They knew it could have been their child. “It’s watching your kid die,” said Linda Cubellis, who owns the B&B and cofacilitates the group. 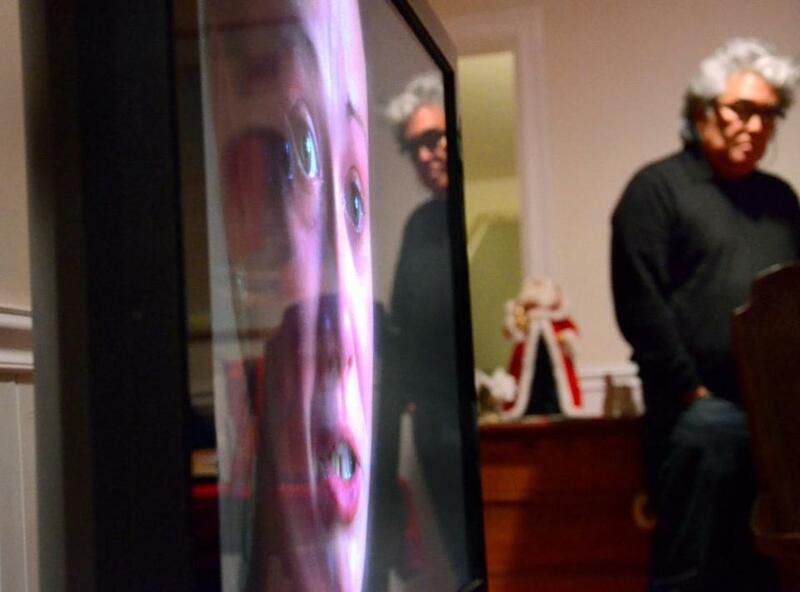 Steve Okazaki, who directed the documentary, reflected in the TV as his film is shown to the Parents Supporting Parents Group of Cape Cod in Bourne. The crowded couch was where her youngest, Corey, 25, slept when he was afraid as a boy. Images of her family covered the walls. Eight kids on his soccer team ended up addicted, she said. Corey got sober the same day his father died after a lifelong battle with dependency. The photos make her cry. Corey is “the sweetest, nicest kid you’ll ever meet,” Laurie Bono of Marshfield said. “There’s not a mean bone in his body.” Bono and Cubellis have known each other since first grade. Bono, too, has a child addicted to heroin. “You never think this beautiful little baby will turn into this,” Bono said. Earlier that day, she’d stood outside a Stop & Shop handing out brochures about addiction. Within an hour, four people walked up and told her they’d lost someone to overdoses. “We’ve put ourselves out there,” said Lisa Murphy of Mashpee, who founded the group. Okazaki’s cameras were present during drug deals, and interviews were conducted at sober houses, where many addicts lived. For those featured, each day revolved around getting the next fix. Half of the young adults in the film began abusing prescription pills after a car or motorcycle accident. They’re soft-spoken and articulate, raised in well-to-do families. They talk of hating heroin and hurting the ones they love. Yet, one young woman said every time she got high it felt like Christmas morning. Karen Herrand of Cotuit said her son, Jordan, 24, lost 17 friends to overdoses. Rehab professionals have called this type of addiction a hijacking of the brain. “If my kid had some other disease that was as dangerous to him as his addiction, people would be bringing me casseroles,” Kathleen Greiner of Marstons Mills said in the documentary. That line elicited chuckles from the viewers, lit only by Christmas lights. Parents of addicted children acknowledge living a life of painful uncertainty; they push the stone uphill, only to watch it roll back down when their child relapses. So they stopped pushing and started carrying their sons and daughters instead. They’ve supported one another through the withdrawals, through the jail time, through the pain. One mother, not much taller than 5 feet, kicked down a crack house door to rescue her daughter. Many carry Narcan, which if injected in time can reverse the effects of an overdose. That’s how another mother saved her son’s life. He lived another three years before dying of an overdose. The mothers commiserated over the number of times a child lied or stole from them. The room filled with knowing nods. From left: Laurie Bono of Marshfield, Karen Herrand of Cotuit, Linda Cubellis of Bourne, and Lisa Murphy of Mashpee watched the documentary.